A generous collection of 52 stories from Europe, Africa, and the Americas that spans two centuries. 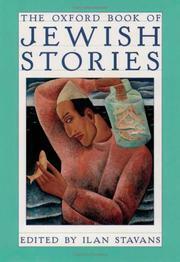 Included are not only the world’s best-known Jewish writers (e.g., Aleichem, Babel, Bellow, Ozick, Oz, Singer, et al. ), but also a few most of us wouldn—t have thought of (Ludwig Lewisohn, Nadine Gordimer) and several neglected masters (the pseudonymous —Der Nister,— Brazilian Moacyr Scliar), along with newer writers (Steve Stern, Rebecca Goldstein, and the really rather phenomenal Allegra Goodman). Only a few stories (such as those by Italo Svevo, Delmore Schwartz, and Bernard Malamud) are certifiable warhorses, and the volume deserves high marks for Stavans’s incisive introduction and informative headnotes, and for its preserving in such attractive and convenient form gems like Israel Zangwill’s —Tug of Loe,— Natalia Ginzburg’s —House at the Sea,— and Alcina Lubitch Domeq’s brief, searing —Bottles.— A landmark anthology.